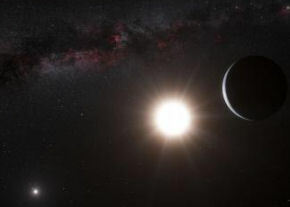 For the first time, astronomers have been able to directly follow the motion of an exoplanet as it moves to the other side of its host star. The star, Beta Pictoris, is only 12 million years old (less than three-thousandths the age of our sun) and is 75 percent more massive than our sun. It is located about 60 light-years away towards the constellation of Pictor and is one of the best-known examples of a star surrounded by a dusty debris disc. 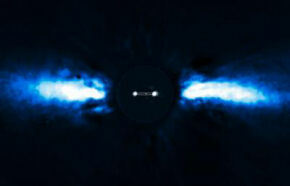 The team used the NAOS-CONICA instrument (NACO), mounted on one of the 8.2-metre Unit Telescopes of ESO’s Very Large Telescope (VLT), to study the immediate surroundings of Beta Pictoris in 2003, 2008 and 2009. In 2003 a faint source inside the disc was seen, but it was not possible to exclude the possibility that it was a background star. In new images taken in 2008 and spring 2009, the source had disappeared. The most recent observations, taken during autumn 2009, revealed the object on the other side of the disc after a period of “hiding” either behind or in front of the star (in the glare of the star). 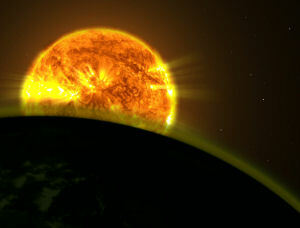 This confirmed that the source was indeed an exoplanet and that it was orbiting its host star. It also provided insights into the size of its orbit around the star. 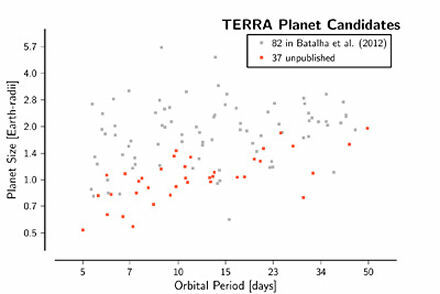 Images are available for approximately ten exoplanets, and the planet around Beta Pictoris (designated “Beta Pictoris b”) has the smallest orbit known so far. It is located at a distance between 8 and 15 times the Earth-Sun separation (8-15 AU) which is about the distance of Saturn from the Sun. “The short period of the planet will allow us to record the full orbit within maybe 15-20 years, and further studies of Beta Pictoris b will provide invaluable insights into the physics and chemistry of a young giant planet’s atmosphere,” explains researcher Mickael Bonnefoy. The planet has a mass of about nine Jupiter masses and the right mass and location to explain the observed warp in the inner parts of the debris disc. Together with the planets found around the young, massive stars Fomalhaut and HR8799, the existence of Beta Pictoris b suggests that super-Jupiters could be frequent byproducts of planet formation around more massive stars.